These words have got me thinking about the nature and meaning of service. It can mean everything from the vocations we pursue (customer service, human service, landscape service, mail service) to the voluntary giving of oneself in support of another. In fact, even the idea of “volunteerism” can be broken down into types of service – one may serve an organization (like a library, museum, or service agency) or one may serve an individual or a family in a personalistic way. It is this deeply personal idea of serving upon another person which is driving my thinking today, as I offer myself to my favorite and only Aunt Lou in a time of great vulnerability. At the moment, she is recovering from a stroke and a series of difficult situations, and is staying in a nursing home for 10 days as her family plans for her return home. My Aunt Lou is a woman who simply will not be institutionalized in her mind, or her body. This makes her particularly at risk as she simply will not “get with the program” . Because we know and love Aunt Lou, we also know she needs to be safeguarded night and day, and have done so. I had this heartbreakingly poignant moment with her yesterday. As is often the case with human service environments, there is a strong staff culture at the nursing home where she is staying. Day and night, there is a lot of friendly talk, laughing and joking amongst the nurses, aides, social workers and others. Some of the people who are living in the nursing home seem to enjoy the repartee, and try to be a part of it. It mostly seems to annoy and confuse my Aunt Lou, who looks at me with a knowing hard look when it happens. When visitors come, she will say, “You will not believe what has happened to me”. This is no small talk, either. The words are sometimes a long time coming, but with focus and time, they do come. The bells and buzzers and alarms and chatter are constant and terribly distracting to Aunt Lou. They also are frightening and foreign to her, and rob her of her competencies, because she cannot easily hear or attend. She is intent on walking, and walk we did yesterday, as she regains her strength, works hard to get her bearings and struggles to understand how life went so bad so quickly for her. On the walk (as she calls it “down the lane”) down an endlessly long hallway and maze of confusing passages and doorways, we passed the busy and active nurse’s station. 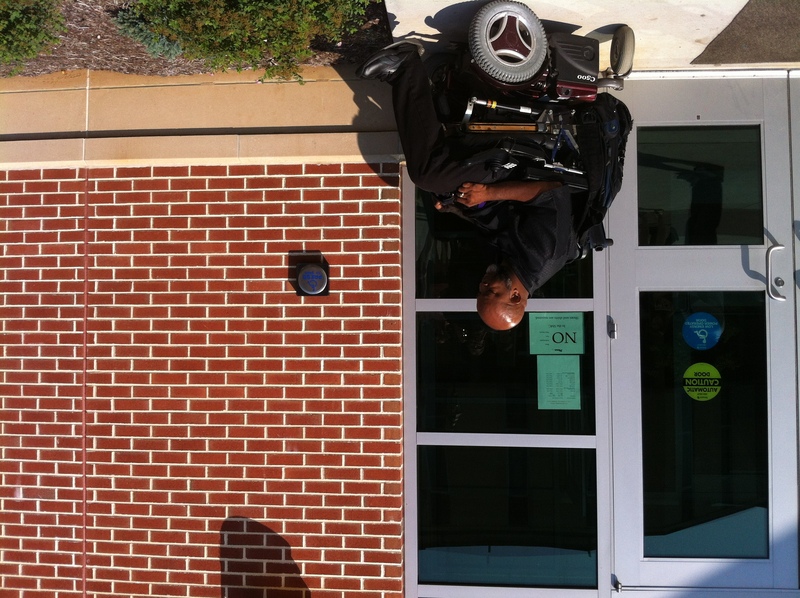 As is usually the situation, many people in wheelchairs encircle the perimeter, perhaps enjoying the staff-centered action that is happening in front of them. Moving forward with determination, but so fragile at the moment, Aunt Lou tenses as the staff burst out in uproarious laughter. She takes a stagger step, which nearly upends us both. Whatever has happened, it is very, very amusing to those involved. The clustered onlookers laugh as well, but are not part of the joke, at least not fully, and they seem tentative. A flash of confusion comes over my strong Aunt’s face, you can see it quickly changes to a more determined look as she puts her head down, bears down on her walker, and moves more quickly. The aide who is walking alongside us, in explanation, mentions that the joke is that one of the nurses just “broke wind”, although that is not the language she used. It is one of Aunt Lou’s euphemisms. As we keep moving, the uproar continues behind us. I was nearly overcome with empathy as I realized the impact that the scene at the nurse’s station had on my Aunt Lou. What does it take to give personal, respectful service to another human being? Can it be done in group settings which require people to conform, and there are people in the role of “staff” who are trying as best they can to cope with a situation which is hard to bear? For me, if I am going to have a professional relationship with vulnerable people, it seems urgent for me to have some relationships with a few people over the long haul who live on the margins, and for whom I have no professional obligation to at all. Shirley Chisholm had great personal empathy for and identification with those at the bottom of the social ladder. I suspect she also had personal relationships which made her keenly aware of the need to stand beside and behind people. My Aunt Lou has always been a powerful role model to me – she raised 6 children on her own, on a social worker’s salary, by the way. She is strong, capable, so smart, and like me, a rugged “horsewoman” and a strong Quaker. The things she is showing me now hurt, but it is the kind of hurt that will strengthen my ability to keep in focus the importance of personally being of service. Social Role Valorization theory has an entire theme which covers the power of unconsciousness, specifically around the realities of how people come to be at the bottom of the social ladder, and what happens to them once they get there. I have always found this theme fascinating and also unsettling, with good reason. The big idea behind it is that social devaluation (assigning a low social value to others) is largely transacted with a surprisingly low degree of awareness on the part of any of us, included devalued people themselves, service workers, and, well, most everyone. Most of us don’t want to admit that there are some people we simply think are worth less than others, and so we tend to deny this reality, or suppress it, or “sugar coat” it to soften it. This result is that the bad feelings that much of society holds towards certain groups of people gets expressed in action, or symbolically. One of the interesting and scary corollaries to this is the tendency for what Dr. Wolfensberger has called “doing/undoing”. This means that when helpful action happens geared towards making vulnerable people’s lives better, another action is likely to occur which “undoes” the helpful action. This allows lots of efforts to happen by really accomplished change agents, while maintaining the status quo of poor life circumstances, and assuring that real forward movement is puzzlingly difficult to make. The “undoing” is hardly ever directly connected to the “doing”, so the net impact is also not recognized. This happens on a big scale. Many thousands of people with mental disorders were de-institutionalized from State Hospitals during the 1970’s through the 1990s across the US. Over the ensuing decades, many thousands of people with mental disorders (many of the very same people) have now been re-institutionalized in our prisons in the role of inmate. One could even say that prisons are the largest provider of residential services to people with mental illness these days. Many of the very same people with intellectual disabilities that we worked effectively and with passion for decades to free from institutions are now re-institutionalized as elders in nursing homes. Doing. Undoing. The net effect remains much the same in terms of the realities for our society and for the people affected by this. We could argue the details and nuances of that, but it is a reasonable thing to say. Doing/undoing happens in small, individual ways, also. A good friend of mine who has a lifetime of involvement in many and multiple human services since he was a young child is continuously receiving goals, support, assistance and counseling about his lifestyle, his weight, and his need for exercise. People are working hard and with good intention to help him with these issues, and they are important. However, at the very same time, he takes a literal handful of pills every day and night, ranging from anti-psychotics, sleeping pills, tranquilizers to anti-depressants, mood- stabilizers, and anti-seizure drugs. Over most of the course of his 35 years, he has taken these drugs compliantly and with little review or oversight or question by anyone. Now he experiences all the conditions we know come from this – weight gain, lethargy, liver damage, partial kidney failure, COPD, congestive heart failure. Meanwhile, everyone in his life is making Herculean efforts to get him to the gym and snack on carrots, and no one is helping him lessen that handful, or even thinking about it. Doing. Undoing. It pays to understand that this doing/undoing is at work. I came across a less toxic, but revealing image the other day, and I think it’s a pretty good example of the phenomenon. Pictured in the photo below is a colleague of mine, who finds himself in a predicament. Can you help unpack what is happening here in terms of doing/undoing?